The Cannon family is a prominent U.S. political family in the states of Utah, Nevada and Idaho which descends from the 19th century marriage of George Cannon and Ann Quayle before their emigration from Peel, Isle of Man. 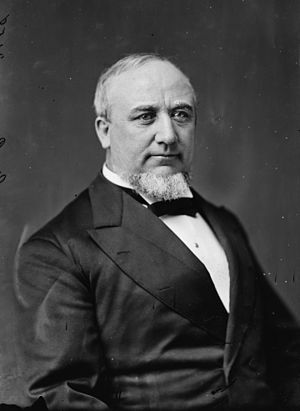 The family's most notable member was their oldest son George Q. Cannon. The family is connected by marriage to the Bennion, Taylor, Wells and Young political families. 2.12 Theodore L. Cannon Jr.
Also known as George Quayle Cannon Sr.
Also known as Angus Munn Cannon Sr.
Also known as John Quayle Cannon Sr.
Also known as George Mousley Cannon Sr. Served from 1963 to 1979 as a vice admiral of the U.S. Navy; and as a recipient of the Navy Distinguished Service Medal, the Legion of Merit with Gold Star and Combat "V" Device, the American Campaign Medal, the European-African-Middle Eastern Campaign Medal, the Asiatic-Pacific Campaign Medal, the World War II Victory Medal, the American Defense Service Medal with Fleet Clasp Device, the Navy Occupation Service Medal with Asia Clasp Device, the China Service Medal, the National Defense Service Medal with Bronze Star Device, the Philippine Liberation Medal and the Order of the Star of Ethiopia avec plaque presented by Emperor Haile Selassie, among others. Also known as Edwin Quayle "Ted" Cannon Jr. Served from 1957 to 1959 as a member of the Utah House of Representatives from Salt Lake County; in 1964 as the Republican nominee for governor of Utah governor, defeated; in 1967 as a candidate for mayor of Salt Lake City, defeated; and as the executive director of the Utah Travel Council where he coined the state slogan "the greatest snow on earth"
Also known as Theodore Lincoln "Ted" Cannon Jr.
Also known as Mark W. Cannon, Ph.D. Serves as a member of the Utah State Charter School Board, and served as a member of the Utah State Board of Education and as the chief-executive officer of the Utah Transit Authority. Cannon, Robert J. "Bob." MBA's We Weren't: Memories and anecdotes of Cannon Electric 1915–1964, and the two men who ran it. Redlands, Calif.: Robert J. "Bob" Cannon. 1988. Evans, Beatrice Cannon and Janath Russell Cannon. Cannon Family Historical Treasury, Second Edition. George Cannon Family Association. Salt Lake City: Publishers Press Inc. 1995. ^ a b c d e f g h i j k l Evans, Beatrice Cannon; Janath Russell Cannon (1995). Cannon Family Historical Treasury (Second ed.). Salt Lake City: George Cannon Family Association. ^ "John Taylor". Find a Grave. 2002-03-12. Retrieved 2011-07-06. ^ "John Taylor". Utah History Encyclopedia. University of Utah Press. March 2004. Archived from the original on 2011-06-08. Retrieved 2011-06-19. ^ a b c d e f "David H. Cannon". Cynthia Burgess "Cindy" Alldredge. 2004-12-28. Retrieved 2011-06-19. ^ "John Taylor, 3rd President of the Church". Church History. The Church of Jesus Christ of Latter-day Saints. 2004. Retrieved 2011-06-19. ^ a b c d e f g h i j k l m n "The Official George Q. Cannon Family History Collection". S. Hunter Cannon. 2010-04-03. Retrieved 2011-06-19. ^ a b c d e f g "Cannundrums". Robert J. "Bob" Cannon. Retrieved 2011-06-19. ^ a b c d "The George and Ann Quayle Cannon Family". Sedgwick Research. Retrieved 2011-06-19. ^ Wiersdorf, G. William. "History of Taylorsville, Utah". OnlineUtah.com. Scott Wiersdorf. Retrieved 2011-07-26. ^ "General Authorities Born in the British Isles". New Era. The Church of Jesus Christ of Latter-day Saints. November 1971. Retrieved 2011-06-19. ^ "George Quayle Cannon". Find a Grave. 2002-03-23. Retrieved 2011-07-06. ^ a b c d e "Cannon family of Utah". The Political Graveyard. Lawrence "Larry" Kestenbaum. 2005-03-10. Archived from the original on 2010-09-08. Retrieved 2011-06-19. ^ "George Quayle Cannon". Utah, the Storied Domain: A Documentary History. USGenWeb Project. 2008-06-27. Retrieved 2011-07-10. ^ "CANNON, George Quayle, (1827–1901)". Biographical Directory of the United States Congress. Office of the Historian. Retrieved 2011-06-19. ^ Murphy, Miriam B. (March 2004). "Garfield County". Utah History Encyclopedia. University of Utah Press. Archived from the original on 2012-01-10. Retrieved 2011-07-26. ^ "Cannonville". ScenicByway12.com. Scenic Byway 12 Foundation. 2011. Retrieved 2011-07-26. ^ "Silk Commission". Agency Histories. Utah Division of Archives and Records Service. 2003-07-30. Retrieved 2011-07-10. ^ "Ann Cannon Woodbury". Find a Grave. 2000-02-02. Retrieved 2011-07-10. ^ "Angus Munn Cannon". Find a Grave. 2005-12-03. Retrieved 2011-07-06. ^ a b "Martha Maria Hughes Cannon". Utah History Encyclopedia. University of Utah Press. March 2004. Archived from the original on 2011-06-08. Retrieved 2011-06-19. ^ "John Quayle Cannon". Find a Grave. 2008-10-28. Retrieved 2011-07-06. ^ "Dr Martha Maria "Mattie" Hughes Cannon". Find a Grave. 2007-08-12. Retrieved 2011-07-06. ^ a b c d e f g h i j k "Historical Listing of Utah State Legislators". Utah State Legislature. Utah State Legislature. Retrieved 2011-06-19. ^ "Martha Hughes Cannon Health Building". Utah Department of Health. Utah.gov. 2009-09-03. Archived from the original on 2011-09-29. Retrieved 2011-07-26. ^ "Frank Jenne Cannon". Find a Grave. 2002-05-09. Retrieved 2011-07-06. ^ "CANNON, Frank Jenne, (1859–1933)". Biographical Directory of the United States Congress. Office of the Historian. Retrieved 2011-06-19. ^ "Elizabeth Ann "Annie" Wells Cannon". Find a Grave. 2009-11-13. Retrieved 2011-07-06. ^ "George Mousley Cannon". Find a Grave. 2009-12-26. Retrieved 2011-07-06. ^ "Sylvester Quayle Cannon". Find a Grave. 2009-12-26. Retrieved 2011-07-10. ^ "Sylvester Quayle Cannon". Utah, the Storied Domain: A Documentary History. USGenWeb Project. 2008-06-27. Retrieved 2011-07-10. ^ "Charles Clarence Neslen". Utah, the Storied Domain: A Documentary History. USGenWeb Project. 2008-06-27. Retrieved 2011-07-10. ^ "Historical Listing of Utah State Legislators". Utah State Legislature. Utah State Legislature. Retrieved 2011-07-10. ^ "Quayle Cannon". Find a Grave. 2007-09-20. Retrieved 2011-07-06. ^ Cannon, Robert J. "Bob" (1988). MBA's we weren't: Memories and anecdotes of Cannon Electric 1915–1964, and the two men who ran it. Redlands, Calif.: Robert J. "Bob" Cannon. ^ "Interconnect solutions history: Cannon, VEAM & BIW" (PDF). ITTCannon.com. ITT Corp. Archived from the original (PDF) on 2012-03-09. Retrieved 2011-06-19. ^ "John K. Cannon". Find a Grave. 2002-07-13. Retrieved 2011-07-21. ^ "John Kenneth Cannon". Arlington National Cemetery Website. Michael Robert Patterson. 2008-05-26. Retrieved 2011-07-21. ^ "Cannon AFB, New Mexico". Military. GlobalSecurity.org. 2011-05-07. Retrieved 2011-07-21. ^ "Cavendish Wells Cannon". Find a Grave. 2010-02-06. Retrieved 2011-07-06. ^ "Cavendish Wells Cannon (1895–1962)". Department History. U.S. Department of State. Retrieved 2011-06-19. ^ "Robert M Cannon". Find a Grave. 2000-03-04. Retrieved 2011-07-06. ^ "U.S. Army Pacific: Biography Lt. Gen. Robert M. Cannon". U.S. Army Pacific. U.S. Army. Retrieved 2011-06-19. ^ "Thomas Quentin Cannon". Find a Grave. 2007-09-20. Retrieved 2011-07-06. ^ "Quayle Cannon Jr". Find a Grave. 2007-09-20. Retrieved 2011-07-06. ^ "[About Ray Cannon Needham]" (PDF). The Cannon Chronicle. Salt Lake City: George Cannon Family Association. 1979. p. 5. Retrieved 2012-12-18. ^ "Commander Ray Cannon Needham". USSTarawaVets.org. USS Tarawa Veterans' Association. 2005. Retrieved 2012-12-18. ^ "Edwin Bennion Cannon". Find a Grave. 2010-09-08. Retrieved 2011-07-06. ^ "Evan John Woodbury". Find a Grave. 2007-11-21. Retrieved 2011-07-10. ^ "Howard Walter Cannon". Find a Grave. 2002-10-05. Retrieved 2011-07-06. ^ "CANNON, Howard Walter, (1912–2002)". Biographical Directory of the United States Congress. Office of the Historian. Retrieved 2011-06-19. ^ "Welcome". Cannon Survey Center. University of Nevada at Las Vegas. 2011. Retrieved 2011-07-26. ^ "History" (PDF). RTIA Highlights. Reno-Tahoe Airport Authority. 2011-04-08. Archived from the original (PDF) on 2011-10-07. Retrieved 2011-07-26. ^ "Ralph S. Cannon". The Salt Lake Tribune. Salt Lake City: Kearns-Tribune LLC. 2006-08-29. Retrieved 2011-07-06. ^ "Ralph Steffensen Cannon". Find a Grave. 2011-07-02. Retrieved 2011-07-06. ^ "Edwin Quayle Cannon, Jr". Find a Grave. 2009-04-23. Retrieved 2011-07-06. ^ "Donald James "Jim" Cannon". Find a Grave. 2010-06-21. Retrieved 2011-07-06. ^ "Theodore Lincoln "Ted" Cannon, Jr". Find a Grave. 2009-07-14. Retrieved 2011-07-06. ^ "Cannon's life filled with ironies". Deseret News. Salt Lake City: Deseret News Publishing Co. 2009-07-15. Retrieved 2011-06-19. ^ "[David K. Winder]" (PDF). The Cannon Chronicle. Salt Lake City: George Cannon Family Association. 1979. p. 1. Retrieved 2012-12-18. ^ "Biographical Directory of Federal Judges". History of the Federal Judiciary. Federal Judicial Center. 2009. Retrieved 2012-12-18. ^ "[Mark Wilcox Cannon]" (PDF). The Cannon Chronicle. Salt Lake City: George Cannon Family Association. 1977-11-16. p. 2. Retrieved 2012-12-18. ^ Camp, Tanner (2012-06-28). "BYUPAS Board Member Spotlight: Mark W. Cannon". Brigham Young University Political Affairs Society. Brigham Young University. Archived from the original on 2013-04-14. Retrieved 2012-12-18. ^ "[About John Pingree]" (PDF). The Cannon Chronicle. Salt Lake City: George Cannon Family Association. 1979. p. 2. Retrieved 2012-12-18. ^ MacDorman, Littleton C.; John C. MacDorman; William T. Fleming (1995). "The Quality Journey: A TQM Roadmap for Public Transportation" (PDF). Transit Cooperative Research Project Report 8. Washington: National Academy Press: 11. Retrieved 2012-12-19. ^ "State Charter School Board profiles". Utah's Public Charter Schools. Salt Lake City: Utah State Office of Education Charter School Section. 2010–2011: 7. 2012. Retrieved 2012-12-18. ^ "CANNON, Christopher B., (1950 - )". Biographical Directory of the United States Congress. Office of the Historian. Retrieved 2011-06-19. ^ "Here's tally of S.L. mayor, council vote". Deseret News. Salt Lake City: Deseret News Publishing Co. 1985-10-09. ^ "Utah Democrats pack little power but lots of energy". The Salt Lake Tribune. Salt Lake City: Kearns-Tribune Corp. 1996-08-25. Retrieved 2011-06-19. ^ "YWCA begins Week Without Violence". Deseret News. Salt Lake City: Deseret News Publishing Co. 1998-10-18. Retrieved 2011-06-19. ^ "Democrats eager for Utah battle". The Salt Lake Tribune. Salt Lake City: Kearns-Tribune Corp. 2000-08-19. Retrieved 2011-06-19. ^ "Unreal world! Our critic gets a peek at MTV's Brooklyn reality show". The Brooklyn Paper. New York: News Corp. 2008-12-01. Retrieved 2011-06-19. This page was last edited on 14 April 2019, at 20:31 (UTC).